As the then Mayor of Moreland, Anthony was the leader of the Delegation. 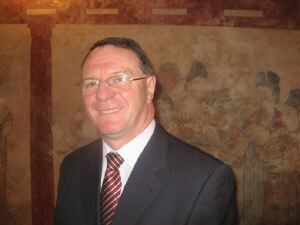 Anthony was elected to the newly created Moreland City Council in 1996 and has been re-elected ever since. This was his third time as Mayor, the only councillor to have been Mayor more than once. Anthony was born in Lebanon and came to Australia 35 years ago. He represents the Lebanese and Arabic communities as a community leader and has played an important role in the multicultural community which makes up the City of Moreland. He has served on many related committees and bodies at Federal, State and Local Government level. Anthony has held a number of Portfolio responsibilites within Moreland Council over the years particularly within the areas of City Infrastructure and Corporate Governance. Mark played a leading role in the preparations for the Delegation. As Portfolio Councillor for Multicultural and Indigenous Affairs he has an active interest in the relationship with Xianyang and the potential of contacts with China at a local government level. 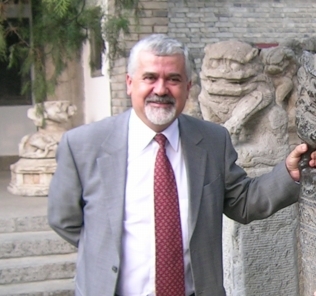 In 2005, when Mayor of Moreland, he visited Xianyang and help revitalise the relationship between the two cities. 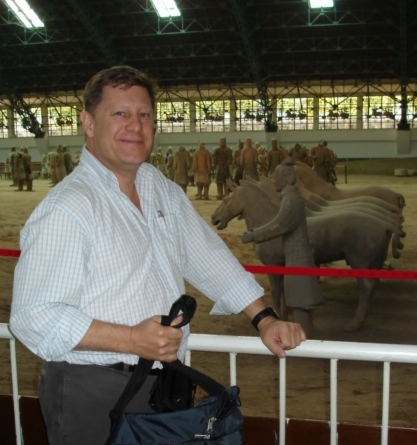 Mark describes himself as the Ambassador to Xianyang. Mark has been a Moreland Councillor for five years and represents the North West Ward. His other interests on Council include age care services, economic development and sustainability, planning and art and culture. Mark works as a Freedom of Information Case Officer in the Australian Department of Immigration and Citizenship. 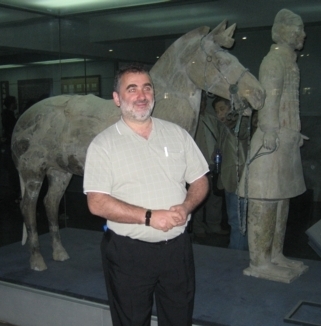 Adem in front of a terra-cotta horse and warrior. Adem is Director of Universal UPVC and Ahssan Trade Pty Ltd. Adem's company sells food machinery to restuarants, bakeries, butchers, take-away shops, etc. It also sells food packaging equipment. Adem was interested in meeting with manufacturers of industrial food processing equipment in Xianyang with the aim of finding new suppliers of equipment for his company. 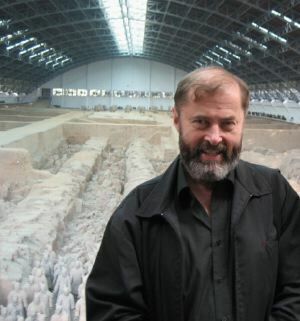 Robert in the Tomb of Princess Yongtai in front of a 1300 years old Tang Dynasty mural. 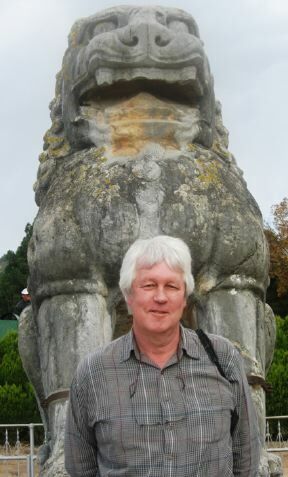 Robert is Director of the "International Centre of Graphic Technology" at RMIT University based in Brunswick. Robert was interested in exploring opportunities of developing closer ties with Universities, Polytechnics or Institutes in China. On this visit he represented two of the departments - the School of Design and the School of Fashion and Textiles. In Xianyang Robert visited similiar institutions to these two departments and was involved in a visit to a cotton factory. 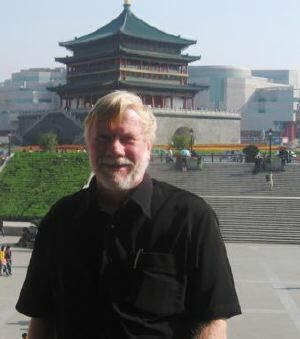 Robert is the Convenor of the community based Moreland-Xianyang Promotion Committee and has visited Xianyang on a number of occasions. With others, he was instrumental in establishing the Special Relationship between the then City of Brunswick and the City of Xianyang. Robert is a Windows and Macintosh programmer and has developed a software product for people with a disability which sells in a number countries. Simon is a Moreland solicitor and accountant and is a community activist. His area of speciality in law is in taxation. 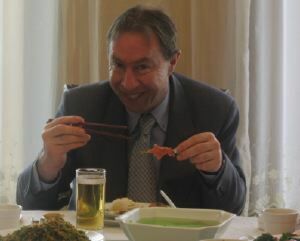 Simon visited Xianyang in October 2005 with Mark Higginbotham when Mark was the Mayor of Moreland. Justin wrestling with a Chinese lion. Justin grew up in Moreland and has strong links with the city. He is currently a music consultant at an International School in Thailand. He also operates a private music studio in Bangkok. Justin studied violin performance and pedagogy at the Victorian College of the Arts, the Australian National University and at the prestigious Musik Hochschule in Vienna. Justin has performed all over the world as soloist and chamber musician at prestigious venues such as Windsor Castle, Sydney Opera House, Melbourne Concert Hall, and New York Town Hall. Justin wishes to build contacts with Chinese professional musicians and music institutions in China. In Xianyang he wanted to visit tertiary-level institutions with strong music departments and also meet with musician associations. 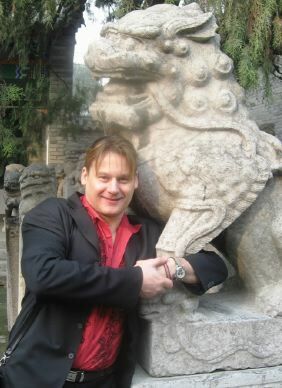 Justin has a desire to forge long-term relationships with Chinese artists and search for new ways to enhance music life in both China and Australia. David is Managing Director of the company "Shanghaied Pty Ltd" which is an importer and wholesaler of homewares, decorator items, antique and new furniture, artworks and outdoor and garden accessories. All the merchandise is sourced from China. David was interested in finding new products and suppliers. Peter before the Bell Tower in Xi'an. Peter is a Director of 3D Funtimes Ltd which is a toy company with an innovative toy that is about to be launched in Australia and other countries. Peter was interested in meeting with a toy distributor and also with a plastic toy manufacturer if there were any in the Xianyang area. Peter is also a lawyer who is active in relation to patents and trademarks and was interested in meeting practising lawyers in Xianyang.